The Sons of Silence Motorcycle Club (SOSMC) is a "one-percenters" motorcycle gang that was founded in Niwot, Colorado in the United States in 1966. The first chapter outside of Colorado was the Iowa chapter which was founded in 1968. There are now American chapters in Arkansas, Florida, Illinois, Indiana, Kansas, Kentucky, Louisiana, Minnesota, Mississipi, North Dakota and Wyoming. The first foreign chapter was founded in Munich, Germany in 1998. In 2001, more German chapters were founded in Freising, Gangkofen and Nurnberg. In November 2007, a Viernheim chapter was founded. 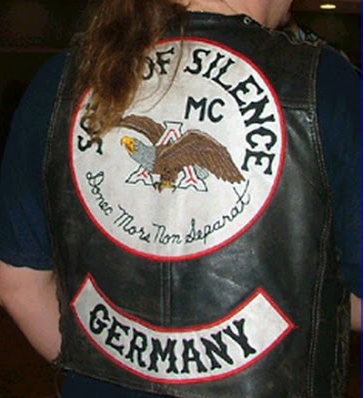 The Sons of Silence's logo is an American Eagle superimposed over the letter "A" (similar to, and taken from, the Budweiser logo) flying under an arch and their motto is "donec mors non separat ", Latin for "until death separates us". The logo is embroided onto the back of all members' jackets or vests. Nazi or White supremacist patches are also common with members. On October 9, 1999, 37 Sons of Silence members were arrested on drug trafficking and illegal weapons charges after one of Denver's largest federal undercover operations. The Bureau of Alcohol, Tobacco and Firearms raided a number of homes and properties in Colorado Springs and Fort Collins, and seized 20 pounds of methamphetamine, 35 guns, four hand grenades, two silencers, cash and motorcycles. The investigation began in 1997 and involved two undercover agents infiltrating the club. The gang was featured in a 2009 episode of Gangland, which included interviews with one of the undercover agents who infiltrated the club. BIKER NEWS: Is Rebel’s son Sasha Mielczarek of Camden Sam Frost’s Bachelorette ‘bad boy’?